The Hungarian central Municipality ASP (Önkormányzati ASP) provides modern, integrated shared services for local administrative management, ensuring standardised internal operation and a common platform for e-government service provision on the local government level to the end-users. 9 sector specific systems are included in the service portfolio, as well as a framework system, that gives the general platform for all other services. Following a three-stage extension period between 2016 and 2019, from 1 January 2019 practically all 3,197 Hungarian local governments have been connected to the Municipality ASP. Based on the experiences of former inefficient local government digitalization projects, isolated back-office solutions and the lack of interoperability on the local public administrative level, the Hungarian Government has decided that IT developments of the local goverments have to be continued in a more centralized way. Due to the need of spreading unified technical quality standards and ensuring an optimal use of investment and operational resources, a centralised application service providing (ASP) model has been chosen as an appropriate solution to promote local government digitalisation in Hungary. The application service provider (ASP) model is largely used worldwide in many business sectors and public administrations since a long time as a cost-effective solution. 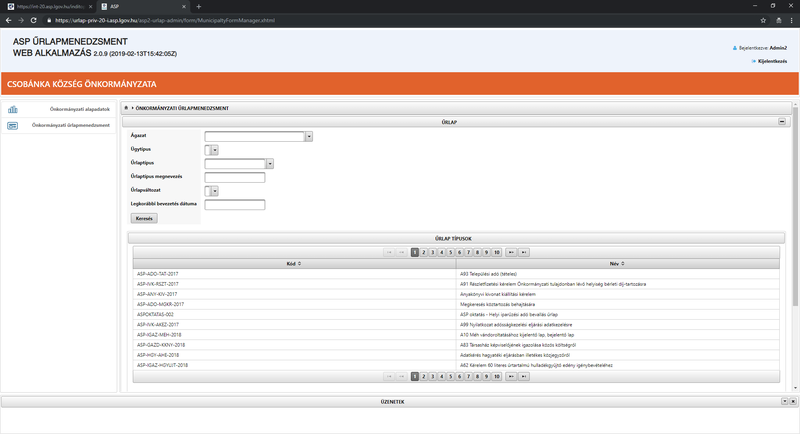 The advantage of the ASP model is that the user can access the software as a service provided by a remote service provider online via a simple web browser. The goal of introducing a central solution was to provide integrated back-office software for local governments and a common platform for e-government service provision on the local government level, so that the end-users (citizens, businesses, organizations) can use unified local e-services all over the country as much as possible. The legal background of the Municipality ASP service and its terms of usage are set in the 257/2016. (VIII. 31.) Government Decree. All necessary documentation are available for the municipalities on the official website of the service https://alkalmazaskozpont.asp.lgov.hu/. The central Municipality ASP targeted all the existing local governments of the country: 3,178 municipalities and 19 territorial local governments (counties). On the end-user side the target users of the service are practically all the citizens and businesses of Hungary. 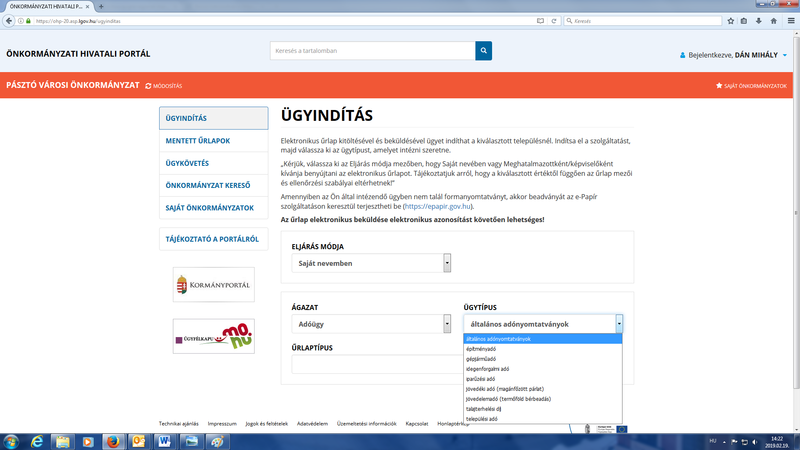 The service has been extended country-wide between 2017 and 2019, as all 3,197 local governments were obliged to use the central solution from 1 January 2019 the latest, meaning that practically 100 percent of Hungarian local governments are now using the central Municipality ASP solution. 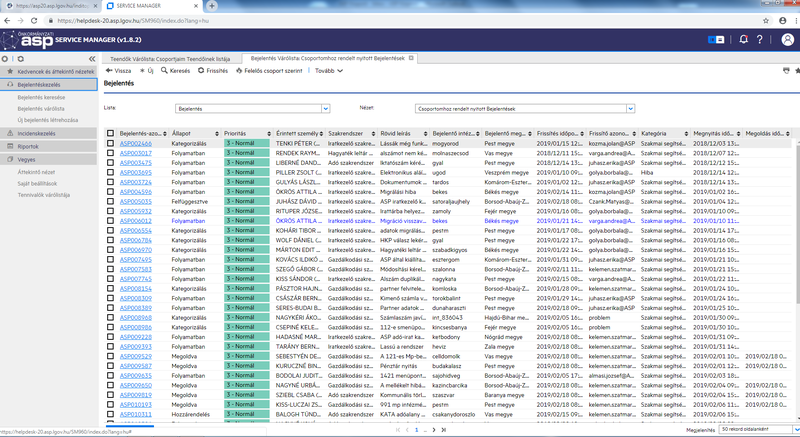 (39 local governments could keep their former systems, that were more developed or integrated than those of the central ASP service, however they are also using the local tax management system and the e-government service portal of the Municipality ASP, and have to connect their back-office systems via interfaces to the ASP’s data warehouse). The project has been financed from EU funds via the Public Administration and Civil Service Development Operational Programme. Regarding the maintenance of the service, according to the 257/2016. (VIII. 31.) Government Decree, the Government operates the Municipality ASP system via the Hungarian State Treasury. The customer support, the application and system support are provided by the Municipality ASP Center of the State Treasury. The maintenance of the base infrastructure is the task of the NISZ National Infocommunication Service Provider Ltd. The maintenance of the service is partly based on a central service contract with the state-owned companies NISZ National Infocommunication Service Provider Ltd. and IdomSoft Ltd. financed by the Ministry of Interior, and partly included within the State Treasury’s own institutional budget that is directly financed by the Ministry of Finance. This means that the service is completely financed from the central state budget, and therefore it is free of charge for the users (local governments), meaning that on the local government budget level significant savings have been realized. The goal of the Municipality ASP is to provide modern, integrated and cost-effective state of the art IT solutions in SaaS model for local governments, ensuring standardised internal operation and a common platform-based provision of local e-Government services to the end-users (citizens, businesses, organizations). At the moment there are 9 sector specific systems included in the service portfolio, as well as a framework system, that provides the general platform for all other services and the basic operational support functionalities. The work of local government administrators is supported by the integration between the systems, as well as by the external data connections and back-office and client-side electronic administration functionalities. The Municipality ASP also provides online form templates for local government reuse, that can be customised by the municipalities with the form management tool provided, and then published on the Municipality ASP’s local government e-administration portal. The Municipality ASP’s systems support the entire electronic administration back-office process, as well as the authentic electronic communication with the end-users via secure e-delivery. From an architectural point of view priority has been given to the compliance with the e-Government policy principles laid down in the domestic e-Government strategies as well as the e-Government policy criteria set by the Ministry of Interior. This also means that the alignment with the objectives of the European Union is ensured. Accordingly, the project has placed great emphasis on increasing the rate of use of open source software, the reuse of existing solutions, improving the transparency of local government operations, with appropriate emphasis on IT security and helping to protect personal and non-personal data. The Municipality ASP service is based on a central hardware infrastructure and a SOA based architecture, with a modular build-up of an integrated service portfolio, using a unified operating environment. Its main elements are the ASP framework system providing the general platform and unified communication for the whole service, and the professional systems of the portfolio that are supporting the back-office tasks of local governments. It was a clear goal to develop technologies that ensure the scalability of the service, such include the data access layer’s technology, as well as the database manager solutions used. This makes it easier to serve both small and large municipalities that have significant difference between their user numbers, data volumes and system loads. Scalability is ensured also by the monitoring system of the ASP service, as such performance and alert indicators have been defined, those help the operation of the service, and provide metrics for future expansions and enhancements. In line with the e-government policy criteria set by the Government and specifically the Ministry of Interior responsible for e-government developments, in order to ensure easy extensibility, the IT infrastructure of the Municipality ASP service has been designed to completely align to the architecture of the central Government Data Center, and likewise it has been procured and installed to complement it. • 6 operational planes, more than 150 virtual networks, thousands of firewall rules, 250 virtual storage volumes, and more than 700 VMware based virtual servers. The specific professional systems of the Municipality ASP service run on VMware blade servers, and this makes possible both horizontal and vertical scalability of the infrastructure, and allows flexible management of the virtual servers’ resources. Regarding the operating systems, mostly open source SUSE Linux Enterprise (with manufacturer support) servers are used, and in some cases Microsoft Windows servers are also in use. As for the licensing metrics, the physical servers (hosts) are covered with licenses, so the number of virtual servers (guest) can be changed freely. In the data base layers PostgreSQL, MariaDB and in some cases Microsoft SQL components are used. On the database level a multi-tenant model has been developed to separate the data of the individual municipalities from each other and to achieve flexible saving and loading of data. Within the data warehouse of the Municipality ASP Hadoop components (Hive, Impala, Zoe Keeper, etc.) are used for data storage and processing. With the distributed storage and processing, large amount of data can be processed in a short time, cost-effectively with the use of open source software. For Hadoop the Cloudera product is in use. The Cloudera Hadoop clusters can be further expanded with new servers. In the data warehouse, standard BI reports are created, displayed and published on the components of Microsoft BI. It has been also a very important objective of the project to improve interoperability and reuse existing solutions such as the regulated electronic administrative services provided by the state (the “building blocks” of electronic administrative processes in Hungary). A good example of reusing existing solutions is the use of the national eID cards for user authentication. As a result, the local government employees can only access the Municipality ASP’s applications by identifying themselves with their own electronic identity card. Another example of reuse to highlight is the electronic administration service provision process, where the project has integrated the centrally provided regulated electronic administrative services (e.g. e-identification, e-authentication, e-delivery, intelligent online forms, etc., the electronic payment service is planned to be introduced in 2019) to comply with e-Government policy criteria and the relevant legal provisions. It was also an important requirement that interconnection with external systems and base registries had to be done via the Central Governmental Service Bus (KKSzB) technical interoperability platform. As a result of the project, a significant step has been made in the case of the connected municipalities at all levels of interoperability, former local administrative silos are gradually disappearing, making cooperation within the public administration easier. Unified advanced e-government services can be provided to the end-users without threatening local government autonomy. The central system is more sustainable economically than the island-like previous local systems of the local governments. The yearly maintenance cost of the Municipality ASP service was ~12,4 million euros in 2018, which will increase in 2019 due to the fact that another 203 mostly large municipalities have joined the service in January 2019. According to the data of the year 2014 when the preliminary planning of the project was done, the whole Hungarian local government level spent ~27,2 million euros on IT services and 17,4 million euros on IT hardware procurement and renovation, meaning in total 44,6 million euros in one year. On the national level ~12,8 million euros yearly can be saved with the use of the central Municipality ASP in comparison with the previous costs of the local governments. In a country of similar size to Hungary, it is possible to introduce a central and efficient solution for the entire local government sector, which can significantly increase the interoperability of municipalities, and allow the provision of unified and advanced e-services to the citizens and businesses. It has been proved very important that during the process of the development and gradual introduction of the service country-wide, the coordination between the various actors involved was ensured continuously. Therefore the regular consultations with the local government associations, as well as the information days and forums organized for local government officials on regional and county level were essential in the success of the project. It is also very important that for the introduction of such complex systems, special emphasis must be placed on the training of the users, which have to be scheduled in accordance with the introduction roadmap.